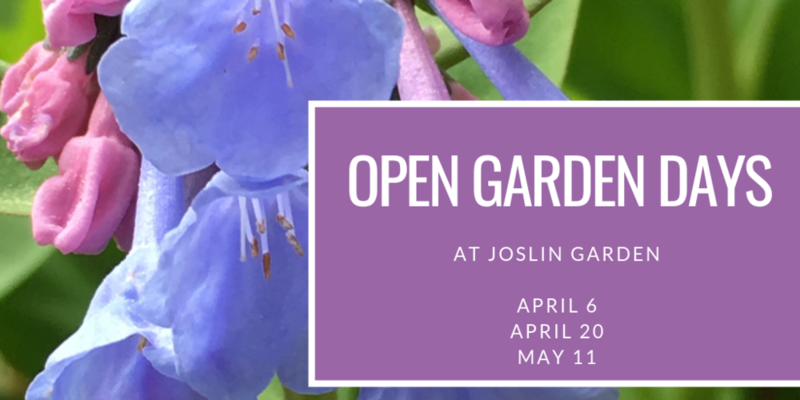 2019 Joslin Garden “Open Garden Days” Announced! This year neighbors and garden enthusiasts can enjoy a tour of Joslin Garden on one of three Open Garden Days. Saturday, April 20, from 1:00 p.m. to 4:00 p.m.
Saturday, May 11, from 1:00 p.m. to 4:00 p.m. The Garden, located at 2431 West Lake Drive, was developed by William and Mary Coker Joslin and comprises more than four rolling, wooded acres, with an extensive variety of rare and native plants. Owned and managed by the City of Oaks Foundation, the garden and Joslin House are being transformed into public garden in partnership with Raleigh’s Parks, Recreation and Cultural Resources Department. “The decision to spread our Open Garden Days over three days will let visitors experience something different each time they visit the garden," said the Foundation's executive director Chris Heagarty. “As the months change, so does the Garden, its mosaic of bright colors changing as spring turns to summer." Other popular spring events are anticipated to return in 2019, with new twists. The popular neighborhood Easter Egg Hunt, and Mother’s Day Tea in the Joslin House will now be charity benefits, to help homeless children attend a week of active outdoor camp this summer, though the Foundation’s Give Play program. Out of respect for the neighbors, guests are asked to park on only one side of West Lake Drive. Please note that there are no public restroom facilities on the property. This gift of their home and garden to the City of Oaks Foundation reflects the Joslins’ vision that their garden would provide a place where environmental awareness and conservation can be nurtured through education and the joy of a deep connection with the natural world. The City of Oaks Foundation is a 501(c)(3) charitable organization that believes in a great outdoors for a great Raleigh. More information about the events will become available closer to the days of the events. For more information visit cityofoaksfoundation.org or follow the organization on Facebook or Twitter.